The 110% Award is presented by the District Governor at District Conference. It recognizes one Rotarian in each Area who has excelled in carrying out the Rotary Mission by giving 110% effort to strengthening their club, increasing humanitarian service and extending Rotary’s public image. The Nominee will have been a Rotarian for at least two years, have held Club Leadership Positions and be on track for Leadership Opportunities. The Administrative Assistant Governor is responsible for managing the Award program. 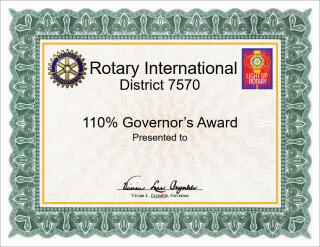 The Area Governor will present the 110% Award Pin and Certificate at the District Conference. Who can nominate: Each Area Governor should nominate one 110% Award candidate. With an award from their district, clubs can honor a Rotarian who participates in service activities in one of the five Avenues of Service — club, vocational, community, international, and youth service. Districts can nominate a member who has performed service in all five Avenues of Service for an award from Rotary International. Honors members who have been actively involved in service related to The Rotary Foundation. Honors individual Rotarians who have demonstrated exemplary service to the Foundation and have received the Citation for Meritorious Service at least four years prior. Honors Rotarians who are making a difference through the Foundation’s programs. Prestigious award for Rotarians who demonstrate their commitment to helping others by volunteering their time and talents. Recognize a club whose project has addressed a significant need in your community. Recognizes Rotaract clubs that are making a sustainable impact in one of Rotary's areas of focus through their innovative community or international service projects. Recognizes Interact clubs that celebrate the founding of the first club during World Interact Week, which occurs each year during the week of 5 November (from Monday to Sunday). Recognizes Rotaract clubs that celebrate the founding of the first club during World Rotaract Week, which occurs each year during the week of 13 March (from Monday to Sunday). Recognize one outstanding alumni association each year for raising awareness of our alumni’s impact on our organization. Honors one outstanding Rotary alumnus each year for their humanitarian service and professional achievements.